The sanitation facility will be set up as an enxperiment with data collection and testing performed on a regular basis. The result of these tests will supply us with data that will be used by future students to advance and improve upon the design of the sanitation facility. In addition, these tests will give the project centre a unique connection with professors and student groups from University of Cape Town who will be able to continue the testing and research after we have left Cape Town. This collaboration is essensial for the water centre to function in our absence. The final result of these tests will allow for a continuously refined proposal to the City of Cape Town allowing them to take advantage of our most recent findings to use for future redevelopment projects. Examine the effect of carbon additive on the composting process to determine the correct type and quantity of carbin material to add. Evaluate availability of material, changes in compost time, quality of compost, and volume reduction or increase. 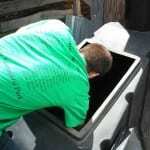 Examine quality and composition of pre-treatment grey water to determine. Experiment with different forms of grey water purfication techniques and compare to effectiveness of installed bioflter. Examine the quality of post biofilter treated grey water on different plants to determine the possiblity of using grey water on gardens. Evaluate pathogen content in plants.